Oh.My.Goodness. 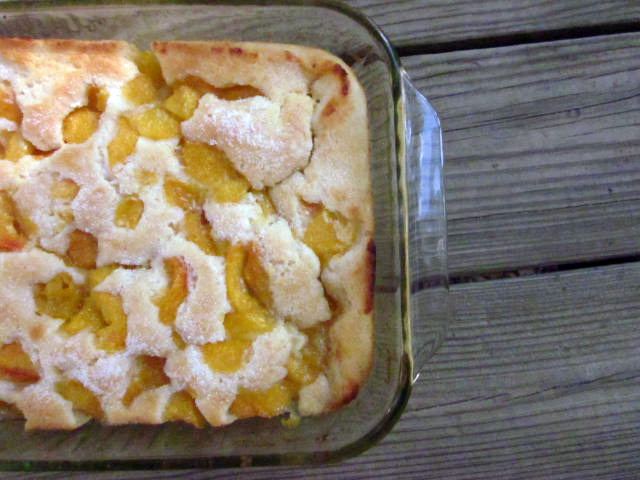 If you are looking for a fresh peach cobbler recipe, this is it. I've tried a few recipes already this peach season and have finally found this amazing recipe by Paula Deen. I adapted it a little bit, including more peaches and some extra sugar on top. I also made my own self-rising flour and was super happy with how it turned out. Thankfully peaches are on sale right now at all the groceries. Will be going and stocking up on more to make more of this delish dish. Enjoy! Preheat the oven to 350 degrees F. Combine the peaches, 1 cup sugar and water into a saucepan. Bring to a boil and then simmer 5-10 minutes. Cut butter into small pieces, place in a 9"x13" baking dish and place in oven to melt. Remove from oven and set aside. Mix remaining cup sugar, flour, baking powder and salt (if using self-rising flour, omit baking powder and salt) together with a whisk. Add milk and stir slowly to prevent clumping. Pour mixture over melted butter. Do not stir! Spoon fruit on top and pour syrup gently all over. Bake for 35-40 minutes or until just beginning to brown and pull away from edges of dish. Sprinkle with 2 Tbsp. sugar and bake for 2-3 more minutes. Serve with vanilla ice cream.